"The width of design possibilities creates business opportunities"
Mimaki Engineering Co., Ltd. (Mimaki), headquartered in Nagano Prefecture, Tomi City; President, Kazuaki IKEDA, announced the release of "LUS-170 clear" UV curable ink capable of being installed in "UCJV300 Series" currently on sale, in October 2018. 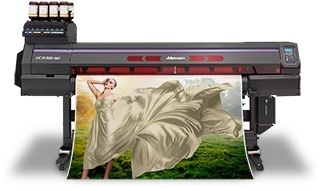 This time, "UCJV300 Series" is mounted with the "Mimaki Clear Control (hereinafter called "MCC")" technology, which has been accumulated for the clear ink print of flat-head UV printers, for the first time as a Roll to Roll printer. Clear ink ejection and UV light irradiation that are performed simultaneously can achieve beautiful clear printing of which dust adherence and bubble generation are suppressed. Also, there are two types of print modes you can choose from depending on your purpose: "glossy finish" that has a sense of class given by shiny sheen and "matte finish" that produces a muted matting effect. Moreover, by installing RasterLink6Plus attached to the "UCJV300 Series", you can use "ARTISTA UV Texture Library" that has 129 types of swatches in Adobe Illustrator. The Library provides plenty of textures including the BASIC pattern that can be used for various purposes, ARTISTIC pattern that uses floral motif and symbols, and MODERN pattern that adds visual effects. Premium value-added prints that can express delicate texture or dramatize fresh and sizzling food by using the "LUS-170 clear ink" will provide strong support for your business. Glossy printing can give the finish of high-quality feeling with the effect of freshness and sizzling of food. 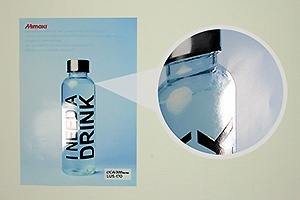 In comparison to a standard poster, a poster wth glossy printing can get higher visibility. 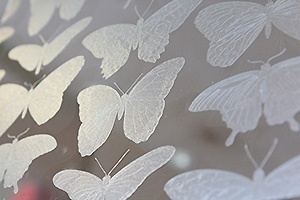 Matte finish printing on the transparent film can create the window display like frosted glass using an irregular reflection of light by the printed clear ink on the film surface. 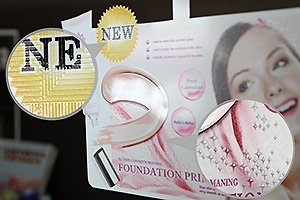 The new graphic expression with the UV clear ink can extend widely the business possibilities. * Specifications, designs and dimensions stated in this document may be subject to change without notice due to technical improvement etc.